Renita says that although she wanted the room to make you feel like you stepped back in time, “It still has all the modern conveniences–a commercial-style range, microwave (hidden behind the “General Store” pantry doors on the left), and a dishwasher hidden behind a green panel next to the sink. She distressed the upper cabinets herself–which are actually old windows scored at a salvage place for $50.00. 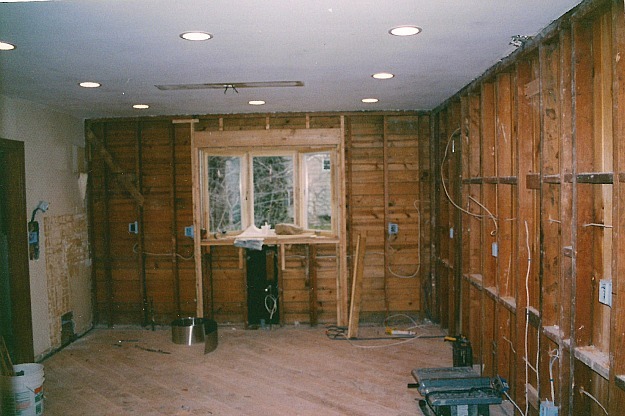 They broke through the old dining room to create one large, long space. Reclaimed beams were used for the ceiling and to frame the opening between the rooms. She adds that “Being the mother of a 17-year old boy, I love the kitchen because his friends (girls) that come over to the house absolutely love it, and he then appreciates me for the next few minutes!” Ha. I absolutly LOVE this kitchen!!!! 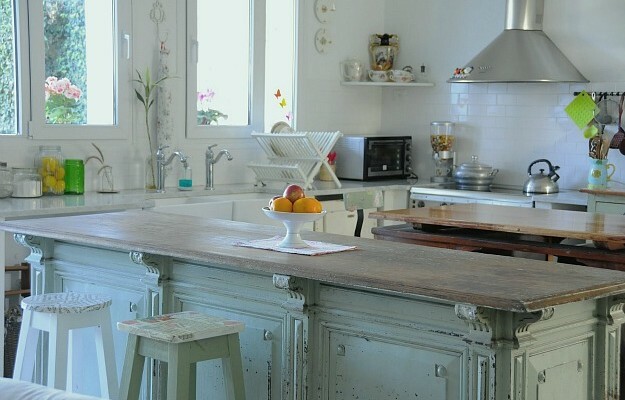 If I could redo my kitchen this is what it would look like! Thanks so much for comments. Have a nice Thanksgiving! Your kitchen is so utterly fabulous and has the jaw-dropping wow effect that I always look for! Wow, wow, wow! Girl you have the market cornered on originality. I now understand what is meant by the heart of the home. You are a very clever girl. Hugs from W Devon England. Thanks, Melissa. I hope to be able to take some pictures around the holidays. Have a nice Thanksgiving and thanks again for your comments. Thanks Angela. I just need to take the time to do that! Enjoy the Thanksgiving holiday. LOVE the floor-love the color combo on the cabinets. My cabinets are actually the same green/white type of combo, with a totally different look which is so cool to see. I also love all the details. 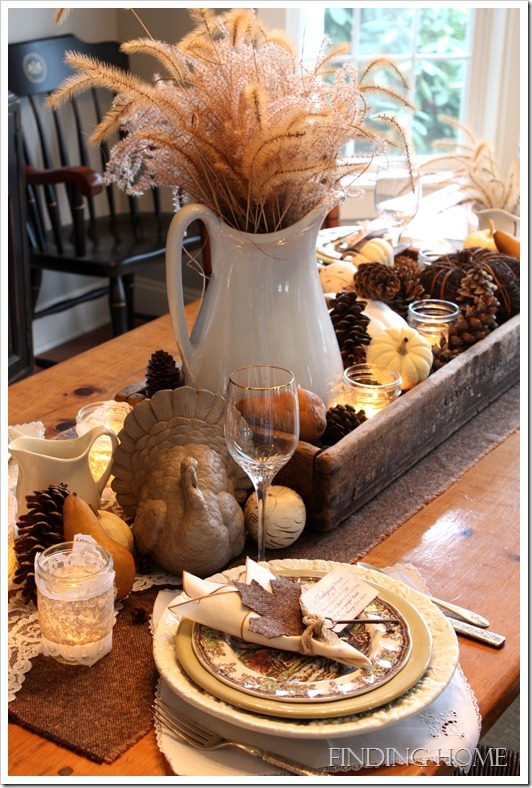 She did a great job of creating an antique look without making it look like a store or like it was staged. It has the look of being collected over time, with things that she loves-perfection, in my humble opinion. Thank you so much for all your kind words. I do love green. Every time I think of changing the color, I just can’t do it! I always feel like when you decorate with green, it is like bringing the outside in. Since I don’t have a lot of natural light in my kitchen, it just works! Again, I very much appreciate your comments. Have a nice Thanksgiving! This space is amazing! So warm and inviting. Love all the different textures and colors. Thanks. I do love color! Have a nice holiday season. Totally warm and inviting. 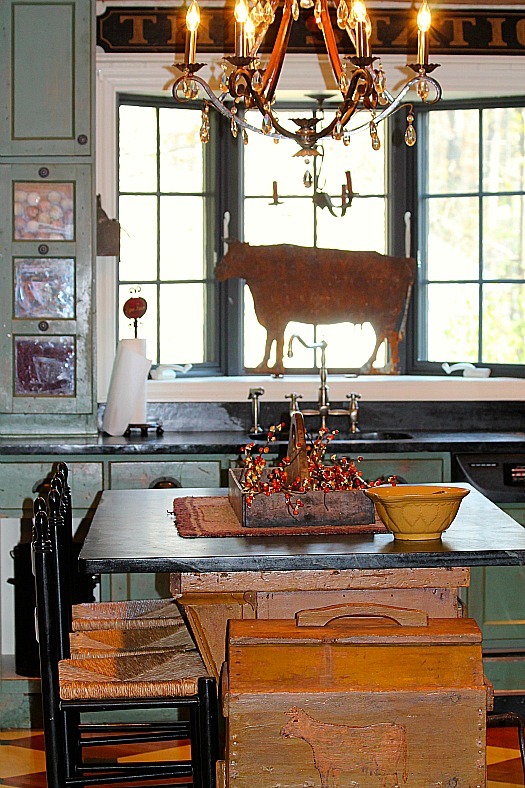 I collect antiques, so I just love this kitchen. My husband found an antique screen door for me that we are turning into a pantry door at our lake home. Wish I could have found a double screen door too, but I’m still thrilled to have one! Great kitchen. Thanks for your nice feedback. Enjoy your screen door! 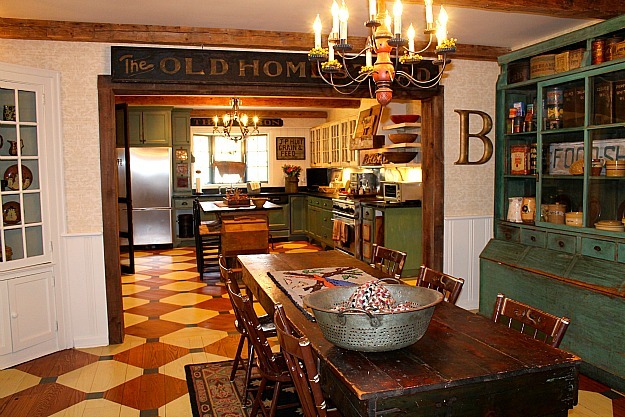 This kitchen is charming! Is Renita a blogger? Do you know if she has shared any other photos of her home? Thank you for such a beautiful blog. I appreciate you! Best renovation ever! Renita — YOU NAILED EVERY DETAIL!! I am in love with your kitchen. I have an 1816 house and although I’ve replaced my countertops with soapstone I really had no idea what to do with the cabinets. This is it! Love it all!! Thanks for your great feedback. Boy, would I love an 1816 house! I am sure it is loaded with charm. Good luck with your cabinets. wow – this kitchen just blew me away! All the old signs, antiques and repurposed items are amazing! And that floor is simply stunning! What an inspiring and cozy space – kudos to Renita. Does she have a blog? Now I want to see more of her house! Thank you so much for your kind words. No, I do not have a blog but I am thinking of starting one in January about my antiquing and decorating adventures. Have a nice Thanksgiving and thanks again for your compliments! This kitchen looks like is evolved over years and was always part of the house. It quietly says old, loved and welcoming. Thanks, Rick. That was what I was aiming for and it is so nice to hear feedback such as yours. So cool. When you said antiques, I did a mental eye roll, expecting counters littered with vintage crap. Instead, you give us this masterpiece of reclaimed woods, windows, and ingenuity. How creative!!!! I like the windows for cabinet doors a lot. Extremely clever. Also, the decorating is bold and Renita is brave. She really trusts her instincts and goes for it. The results turned out fantastic. Thank you for your comments. I am glad you enjoyed all the pictures! I wanted to see more! All the old signs are just perfect for the space. Stay tuned–I’m going to show you her renovated dining room next week. I love it, too! Thanks so much Lori. I seem to like signs more than anything else. I picked one up this weekend at an antiques show that says, “ROOMS”. I always wanted one that said that. It has old glass that outlines the letters and I was thinking of electrifying the back. That is probably my next project! I love your name! I just went to a show this weekend and picked up a sign that says “ROOMS” as well as 6 small old buckets, three in red, three in white and three in blue. I have a red, white and blue guest room (with an Uncle Same and all) and I put the buckets on an old blue shelf. Looks pretty cute! Enjoy your holiday season and thanks again for your comment. While I like her kitchen, I wouldn’t call it “stepped back in time” because if you actually did step back in time, there wouldn’t be any cabinets and it definitely wouldn’t look like this. Kitchens used to have only freestanding furniture, and a heck of a lot less of it — even a fancy kitchen only had a table, maybe one Hoosier-type cabinet or similar, and an icebox. Kitchen cabinets only started being a standard part of houses in the early 1930’s at the earliest, I think. I don’t think she meant that it was quite that far back in time, when kitchens didn’t have cabinets! Ha. She was talking more about a feeling than an exact replica of an earlier time. Yes, I would love to have freestanding furniture. I love Hoosiers as they have a lot of function and charm. Gorgeous kitchen! Especially love the hardwood floor. Thanks, Melanie. I appreciate your kind words. Beautiful! This the the best kitchen in your contest so far! Antique style done right! I love everything, but the screen doors- winners! Thanks for your comment. The screen doors were a pain in the neck to get back from Nashville, but I am glad we went through the trouble. Now THAT is a cool kitchen! Thanks, Amanda. Have a nice holiday season. Wow. Just… wow. That’s very possibly one of the coolest kitchens I’ve toured! I need to start thrifting more!!!! Thanks. Thrifting is the way to go 🙂 Enjoy! What can I say that hasn’t already been said ~ I absolutely LOVE THIS!! From one Jacob’s mom to another – thanks! Absolutely beautiful. Love that green! 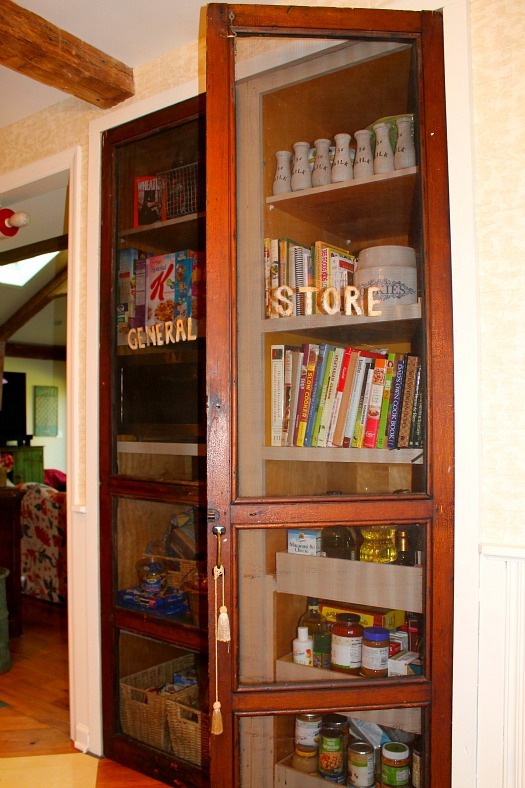 Can I please steal those General Store doors for my pantry??? Thanks for the “green” compliment. Love green (and red)! I love everything about this kitchen! She did a great job and I like the story about her son’s (girl) friends! Thanks for the comments. With my teenager, I will take appreciation any way I can get it! Beautiful kitchen! Bravo to Renita for combining modern beauty with antique beauty! That is hard to accomplish and she pulled it off very well! 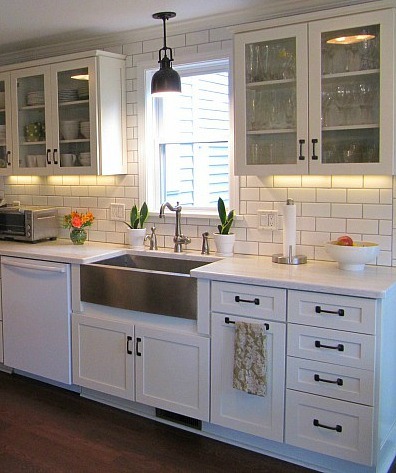 I love the white kitchen…but it’s *too* white for me; no wall space for color or artwork. Over-all, I have to say that this is my favorite so far! Thanks, Catherine. We just painted the white one weekend a few weeks ago. I seem to be in a lighter phase right now. I love it! 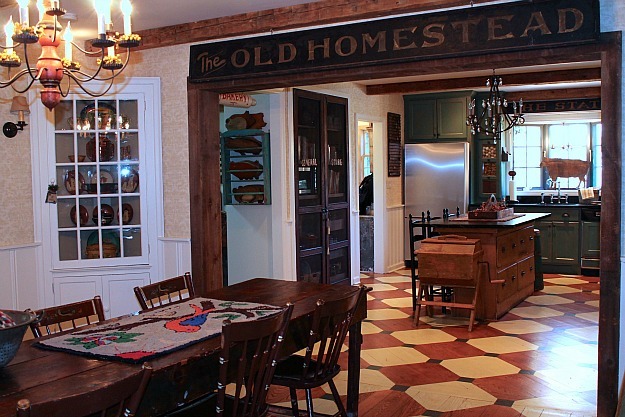 My house was built in 1862, though the kitchen addition is more modern 1903. I wish it looked like yours. Very nice! I really love the floors, the screen doors, and the green. The stainless appliances work well with the colors, too. WOW so creative Julia…………….love how she married the floors…. LOVE this renovation, especially, as others have said, the floor. And The breakfast table is a perfect complement to the space. Congratulations. I had full intentions of sending pix of my own kitchen but a little thing called a hurricane knocked us on our keesters. No power for 11 days. Trees down all over the place, 100 and 200 year old trees. But what kept us going is the sense of community, living in a small town. Gotta say, I’m Hooked on Neighbors. Great other kitchen photo submissions. I’m glad you’re all right! I was thinking about you and my other readers who were in the path of the storm and hoping for the best. Just kills you to see all those trees and houses wiped out by it. Times like that definitely make you appreciate your neighbors! We, too were affected by the hurricane. It is amazing and scary that Mother Nature can be so brutal at times. Wishing you a nice Thanksgiving. Cute cute cute! I could have a rootbeer float in that kitchen. What a great design concept! Thanks for your comment, Christina. Love Texas. We lived there for many years! Oh my god, I LOVE this kitchen! So gorgeous, and so much character! Absolutely fabulous. Thanks for sharing it! Wow, this kitchen is truly transformed from a dowdy little room into a truly liveable kitchen. It looks great and so inviting! I love this kitchen so much! It’s the winner as far as I’m concerned. My kitchen looks way too much like the ‘before’ photo, so this has really inspired me to do something with it. Thanks! Thank you for your comments. I am so glad that my photos have inspired you! Good luck with your kitchen. Stunning absolutely gorgeous !!!! Can you come and remodel mine next !!!! Beautiful floor, lots of creativity and so cozy and warm!! Winner winner! Ding ding ding! This has got to be my favorite kitchen of all time! It is definitely one of a kind. I’d LOVE to cook and just stand around in it! I don’t blame her son’s friends for wanting to come over and hang out in there. 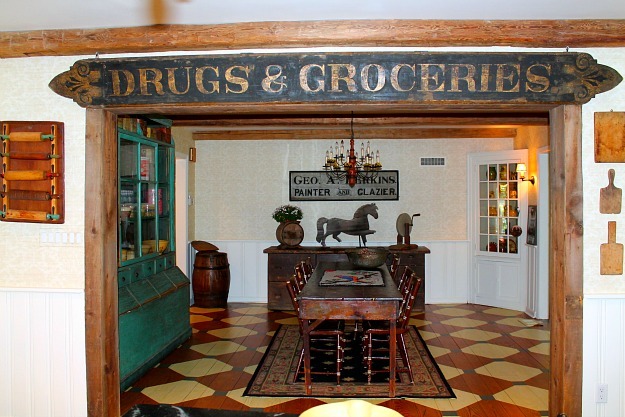 The general store doors are such an awesome idea….I can almost hear them slamming right now…..I’d love to see the rest of Renita’s home. This has been such a fun contest. I love seeing real homes! I really appreciate all your nice feedback! Just wanted to say “hello” and to thank you for all the effort you put here. You’re amazing! WOW! I am in love with Renita’s kitchen makeover. It’s wonderful to see how cleverly she combined the old and the new. The result is not only homey and beautiful, but distinctive. The old-window cupboards are genius. Thank you Jane. I am glad you liked it. HOW did she make the window-cupboard doors?? I love love love that. 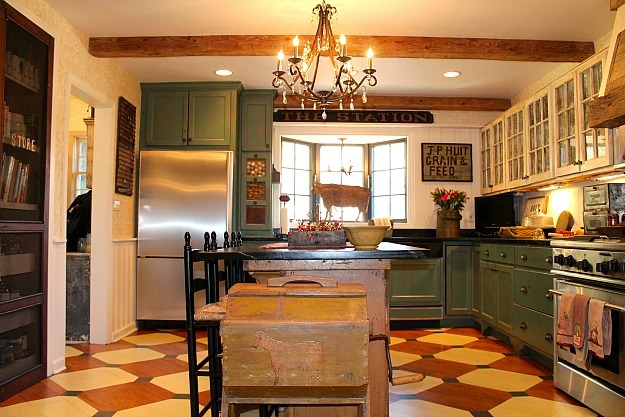 This is a great, warm kitchen…I love the beams. We are going to open our kitchen/dining room area to make one large room and I know I’m going to use some of the elements she has done so well! Thanks for the kind words. We purchased the windows (the center ones are larger than the ones on either side) and we cut them down to fit the backs of the cupboards. What a unique and special kitchen! I’d love to see the rest of the house! I can only imagine what the rest of the house looks like? What style house is this in and what part of the country? Great eye, if Renita isn’t a decorator, she should be! The rest of the house is very much like my kitchen. 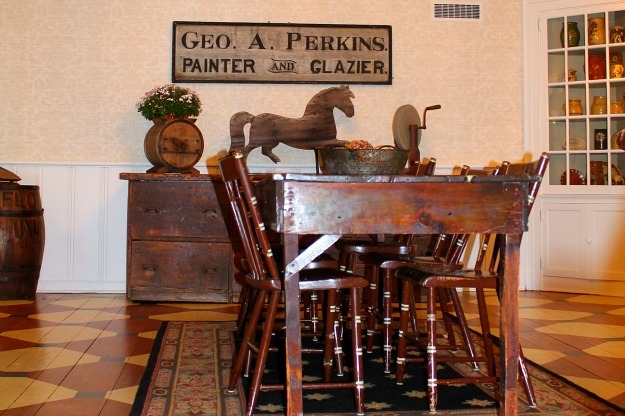 Lots of old signs, painted furniture, folk art and hooked rugs. My house is a 1939 cape cod. I live in a suburb of New York (approximately 30 minutes north of New York City in Westchester County). Transforming two separate rooms into a single kitchen is a great idea. The windows are a great idea from a green perspective. The modern appliances look appropriate and not out of place. Even the chandelier looks great, would of never thought of a chandelier in a kitchen but it looks great. Kudos to Renita for her bold ideas and tying everything together! Thank you. I love using chandeliers in unexpected places. I have one in my bathroom as well. Once again, thanks for the compliments. Renita’s house is gorgeous! Wonder how big it is? Is she a professional decorator because it seems as though she is not according to the blog. What is her day job? Is her house an old house and what style? Great ideas, must have been a boatload of fun to find all those signs and pieces! My house is a 4 bedroom cape cod built in 1939. No, I am not a professional decorator but ocassionally I do design work on the side. Yes, I love the thrill of the hunt finding antiques. All this kitchen needs is some stuffing and a Thanksgiving turkey! Beautiful house and such an inviting kitchen! The color palette works together so well! Also – if Renita does a follow-up on any of our questions, would she tell us what brand the range is? Also, I’m guessing there’s a fan/vent thing (don’t know the word!) that’s hidden behind the big slab of wood over the top of her range…is that right? Was it just installed like normal and then you added the hood and the wood? The range is a GE Monogram. Yes, your are correct! The vent is behind the “chimney” above the range. The hood was custom built and we added the reclaimed wood for character. The fan motor is vented on our roof. Thank you for the answers, Renita! Have a great Thanksgiving, Julianne. Nice to be able to work with modern appliances yet feel like you are in an old kitchen! I feel as though there must be a story behind that wood above the stove? Yes, Abby. You are correct! We found the reclaimed wood beam approximately two hours away from our home. My husband drove up to pick it up with our then 4 year old in tow. Needless to say, neither one of them was pleased! He had to drive back with the beam sticking out of the back of our jeep. It was much longer and had to be cut down to size. Renita is a dear friend of mine and I am lucky enough to actually get to drink coffee and dine in her beautiful kitchen!! She is unbelievably talented- I’ve watched her antique cabinets, paint walls, rearrange furniture…it is truly a labor of love and it shows! If you love her kitchen you will be in for a treat when you see photos of the rest of her house! You are an amazing friend and I am so lucky to get to share the conversations we have (about anything and everything) in my kitchen and yours! Wow! This kitchen is amazing! I could just imagine preparing a wonderful Italian meal in there. What lovely knicknacks! Great signs! I love how warm and cozy this kitchen feels. I bet lots of wonderful meals are cooked in there. This kitchen is a true inspiration to someone who normally just goes to the kitchen for a quick snack. This aesthetic taste is quite pleasing to the eye and shows you the dedication and determination Renita had to transform her vision and ideas into a reality!!! Wow! What a gorgeous reno. This is the type of kitchen than is warm and welcoming. Thank you, Renita, for sharing your beautiful kitchen and thank you, Julia, for featuring this one! The creativity of repurposing so many pieces is truly inspiring. Now this is my kind of kitchen!! Absolutely LOVE it!! Wow, I am in love love LOVE with this kitchen! I would never want to leave it. What a fantastic job she did on it! Great job. Definitely the kitchen with the most personality and creativity so far. As I love old things, too, this one appealed to me. I’d like to know more about how the lower cabinets were distressed and painted (love that color green) – I bet there were lots of steps involved. Great use of upcycled pieces. The only thing I’d change is the kitchen chandelier – seems a bit glam for the old general store, worn and primitive country look going on. My favorite thing is the old window cabinet doors with curtains behind them. Love the finish on them, too. And then there’s the beams, the general store counter and doors, the hood, the soapstone, the paneled wood backsplash/wainscoting . . . I could name everything. Thanks for all the compliments. Yes. 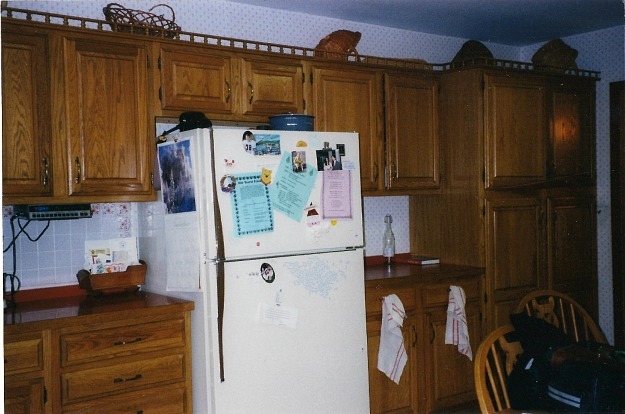 There were many steps involved with the lower cabinets. Staining, painting, sanding and then poly-ing. Again, thanks so much for all your kind words. Oh wow! This is an amazing kitchen! If I had this kitchen, I just might learn to love cooking! I wish Renita would redecorate my home. Absolutely beautiful. WOW! What a transformation. I love everything about this kitchen. It brings you right back in time while still being able to enjoy modern day luxuries. I don’t like to cook or entertain but if this were my kitchen I definitely would. It takes a special talent to blend the old with the new and Renita was definitely born with that gift. I wish she had her own reality show to help the rest of us:). This kitchen is giving me so many ideas! I love that floor. Great use of paint. I love the hood over the range. Amazing what you can do with old wood. Everything works together in this kitchen. Even the signs are great. Thanks for sharing. Thank you for all your compliments! I agree…this is what I’d do to mine, too. Love every detail. Am so impressed and envious and inspired. This kitchen ticks all the boxes for me. Luvvvvvv it. Million dollar houses all decked out by overpriced designers couldn’t hold a candle to this truly remarkable kitchen. Holding my breath to see the rest of her home. Thanks so much sandyb. It’s funny you said that…I remember watching the movie, “Sleeping with the Enemy” and liking the charming house that Julia Roberts rented in the college town way more than her beautiful beach house that she shared with her husband! That is one of my favorite kitchen renos. Love it! I really like it, especially the floor. The one thing that doesn’t work for me is all the signage. It made me think of little specialty shops they make for tourists. Thank you. I am glad you like the floor. It took a while to figure out what to do with it! I love, love your kitchen, I would really like to see pictures of the rest of the house! Thanks so much. I believe that Julia will be posting pictures of my dining room this week. I am absolutely in love with your kitchen! My favorite part, if I could only pick one is the “General Store” doors! Awesome job! Thank you Laurie, I appreciate your nice comments. Like everyone else, I love this kitchen. And the floor! Wow! Just curious, how tall are your ceilings? The ceilings are 8′ tall. Thanks, I thought so. That’s what I have to. I’ve been debating having my lower cabinets painted darker, your kitchen is giving me the courage to go for it! I’m so glad. It’s only paint – worse comes to worse you can paint over it. This kitchen is by far the winner! Just so cozy, I can just see a family having Thanksgiving dinner in that dining room, with everyone coming into the kitchen to chat and wait for dinner. I currently live in a 1960’s ranch house and long for the day that we get an older home and I can redo the kitchen to look like that! I would love to see the rest of the house…. That is exactly what we do – everyone seems to congregate in the kitchen no matter what! I am a little late to the party but oh so glad I finallly made it!!!! This kitchen blows me away with all the charm! Love it. I would love to know, Renita, what color of green is on the cabinets and what fabric you used for the uppers???? Thank you so much for sharing and hurry up and start a blog! Hi Andrea, I’m Jane from wayyyy up above. I keep coming back to this blog post hoping for any hints on the paint colour etc. — so glad that you asked and I’m going to keep checking back to see if Renita shares 😉 Thanks again Renita, I loved that you replied to all the comments (including mine) and I can’t wait to read your blog! I promise I will check on the paint color when I return from my trip. Also, thanks again for your interest. I am excited to start my blog and as mentioned to Andrea I took a number of pictures today that I will post on my upcoming blog! I can’t wait to start! Being late to a party is fashionable so they say! Welcome 🙂 Thanks for your very kind words! I am traveling and do not know the color green off the top of my head. I will check when I get back home. The fabric used for the uppers was a blue/taupe toile from Country Curtains. I bought the fabric and had them made into curtains. Thanks for your interest and enjoy your Thanksgiving! I am late to the party as well! I LOVE this kitchen!!!!! Well done Renita!!!! You have a real gift. It is absolutely charming! That floor is fabulous! Each wonderful detail just adds that much more to the entire effect. It has so much character and is incredibly inviting! I will be thinking of you serving that turkey tomorrow in this amazing space. I LOVE this kitchen! It is so my taste! I must come over for coffee to see it and the rest of the house live. Renita, you are incredibly talented! Thank you so much! I appreciate the compliments. Happy Holidays! I LOVE LOVE LOVE THIS KITCHEN. This kitchen is so rich in style – I think the floor makes the entire space! And – I love how things are matchy – well done!! About 25 years ago or so, I wanted to put fabric behind my cupboards like this woman did. Everybody thought it was nuts:) I could SEE it in my mind – it would have looked great . . . but we moved to a cottage on a creek – much smaller and cozier. Thanks for your kind words, Karen. I need new ones, as well! 🙂 Have a great holiday season! I love old signs and graphics. Your kitchen is wonderful. Thanks so much Dixie. We renovated some time ago. I tried looking for a record of the color with no success. I believe that it was a color by the Old Milk Paint Company. I hope that helps. If I find it, I will leave another comment. I, too, especially love the floors. We’ve been in our house for 17 years and have 3 kids. You can imagine the wear on our hardwood floors. I have strongly considered a pattern similar to this in our kitchen. What type paint was used? Did you do it yourself? What was the process? I would love to see pics of how this flows into joining rooms because I was unsure how to stop the pattern in the doorway to our hall/ bathroom and family room. I would love to see the rest of Renita’s home. This kitchen is by far my favorite! Hi! I’m really late to this party, but oh my gosh! I absolutely love this kitchen! I love homes that show the personality of the people who live there. 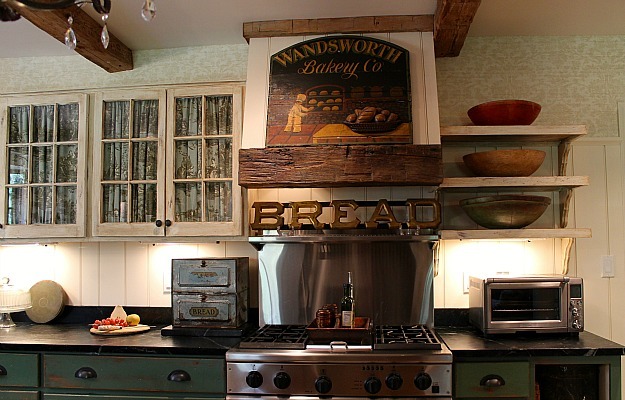 This one is beautiful I’ve also been trying to figure out exactly what to do with my honey oak cabinets in my 1935 home. Our kitchen was remodeled by the former owners and, lets just say…. it’s not my style. I want the house to look it’s age, not like it was built in the late 90’s. I’m very interested in the green color as well. I have been looking at green paint for the lower cabinetry, but everything seems too country. I’d love to know what color you used! Great job! This is my first time looking at all of these beautiful kitchens! So much hard work and love put into all of them, but this one is my favorite. 🙂 Love the old-world, vintage feeling throughout the rooms. Wonderful! This is one of the most wonderful kitchens I’ve ever seen. I love everything about it. I could live in this kitchen. It is so homey, warm and just charming. It’s fun to just study the pics, I see something new every time. This kitchen is a masterpiece! Seems like a lot work has gone into this beautiful kitchen. I adore the pantry doors and am a sucker for anything vintage!